Island Peak (6189 meters) is the popular climbing option for many trekkers and summiteers before they start off for the actual mountain expedition. The peak rests on the vicinity of Mt. Everest in the Khumbu region bordering Tibet. The Island Peak is an extended part of Mt Everest and southern ridge of Lhotse. The peak towers above the Chhukung valley like a sea of ice. So, the peak got its name as Island Peak. The peak has its local name as Imja Tse. The Island Peak Climbing trip starts from Lukla after the 45 minutes flight from Kathmandu. 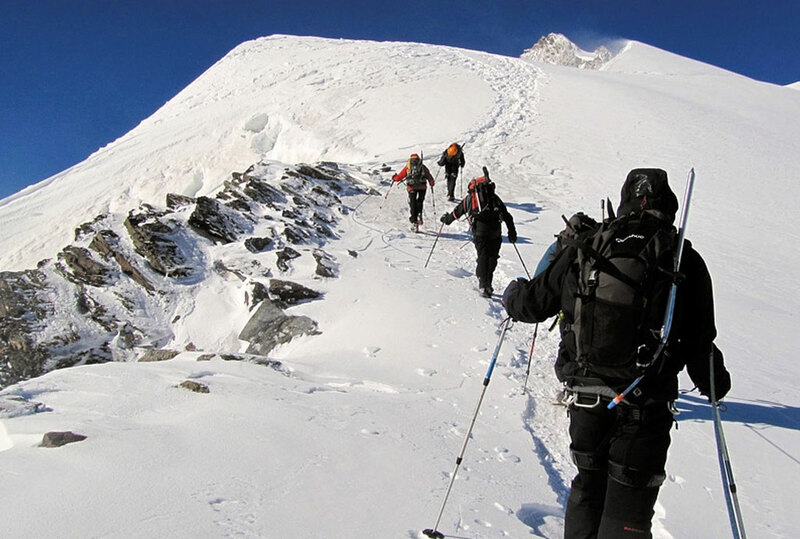 Many climbing enthusiasts plan this peak climbing as a combined trip to Everest Base Camp trek. Once you reach the Island Peak summit you will get the spectacular close-up views of Mt. Everest, Nuptse, Ama Dablam, Thamserku. The first person to climb Mount Everest – Sir Edmund Hillary and Tenzing Norgay Sherpa, also did a practice climb on the Island Peak. After the successful summit over the Island Peak, they started the Everest expedition. So, many expeditions opt to walk in the footsteps of Hillary before they go for Mt. Everest. The peak is technically less challenging. However, you have to use climbing gears like a climbing harness, crampons, ice ax, ropes. You do not need them often but at some points, they are very essential in the climb. Actually, before the summit, you need to cross a 300-meter headwall which is the challenging point of the tour. Any type of climbing enthusiast can opt for this climbing. But, you must possess climbing knowledge, training, and proper clothing along with trekking gears for the successful ascent. With proper physical and mental strength, packing, and technical skills you can complete the climb successfully. Island Peak is among the easy climbing peak in the neighborhood of Mt. Everest. But since this is a high altitude walking on the mountains you may face many challenges on the trip. On this trip, you have to spend many days on high altitudes and in cold weather so you may face many unpredictable situations. Also, before the final ascent to the summit, you have to cross several crevasses and walk on the rock sections. That adds difficulty to the climb. At such portions, you must properly use your trekking poles, climbing gears, and follow your guide’s instruction. Also, the high altitude has a high chance of giving you altitude-related sickness. So, you must spend enough time on acclimatization. And, maintain body hydration while maintaining the walking pace. But no worries! You can easily overcome these trek difficulties with proper training, preparations, and clothing. The month of September, October, November (Autumn) and March, April, May (Spring) are the best time for Island Peak Climbing. These months have the most stable weather conditions and lesser chances of dense fog with poor visibility. The mountain weather is quite unpredictable as it fluctuates every hour. But, in Spring and Autumn, you will find quite moderate temperatures with the calm weather conditions. However, you can also attempt this peak in winter (December, January, February) too. But for that, you must be extra prepared for the harsh cold and dense snow on the climbing trails. Also, you can attempt the peak in the summer time but the rain and fluctuating monsoon weather may add more challenge to your climb. So, if you are a novice climber then you should attempt the peak in peak seasons instead of challenging your body and weather. Island Peak is among the easy climbing peak with less technical difficulties. But that does not mean you can do the climbing easily like the short hikes. The mountain weather, altitude, the snow-covered slopes, and crevasses add challenge in the climbs. So, you must take pre-ice climbing sessions and other fitness training before the actual climb to reduce the risks of potential challenges that may come along. Before you start the actual climb on your new mountaineering shoe you must use them a few times beforehand. New shoes can result in blisters and other uneasy situations. So, you must break them prior to the actual climbing. When in high altitude and cold weather you must properly pack your clothes and climbing gears. You cannot compromise your life in such wilderness and cold. So, before you plan this trip, you should collect enough information on the weather and temperature of the region and pack accordingly. Climbing to the unknown paths covered in snow and cold surrounding is a real challenge. If you have a well-trained and experienced climbing guide s\he will guide you along the crevasses and steep slopes safely. They will take care of you throughout the climb and ensure proper safety. So, before you hire one, check if they are experienced and has prior guiding experience. In the high altitude, the risk of altitude sickness increases along with the climbing adventures. To escape this, you must spend enough time on acclimatization so that your body gets adapted to the changing altitude and weather. Along with acclimatization, you must maintain your body hydration to keep yourself healthy and fit. During Island Peak climbing you will mount to the maximum height at 6189 meters. But, not many people are accustomed to such height. So, before you attempt this peak climbing if you already possess the experience on high altitude climbs then you will have a much easy time in the mountain. Although Island Peak is not technically difficult you have to use climbing gears like a climbing harness, crampons, ice ax at some points on the climbing route. For such a situation, you must possess the skill on fixing ropes, using a harness, ice ax, and other gears for your own safety and successful ascent to the summit. The weather conditions of the mountain region fluctuate every hour. The clear morning may also bring the hazardous wind in the mountains. Also, there could be the risks of landslide and avalanche breakdown during the dense snow. So, before you traverse to the new destination, you should get the proper information on the possible unpredictable that may happen anytime on the trail. Island Peak Climbing is an amazing climbing experience where you get the feel of a mountain expedition in the less challenging trails. This popular climbing peak attracts many travelers and climbers every year. So, when are you planning to join this adventure?